Marianna Marx creates whimsical illustrations from her studio in Melbourne's north. Within the process of creating each drawing Marianna dives into her imagination to a place where anything is possible. Without ordinary limitations her characters seem to find themselves on the most quirky and fantastical adventures. She is inspired by many things, including the changing seasons, colours, patterns and her experiences travelling. 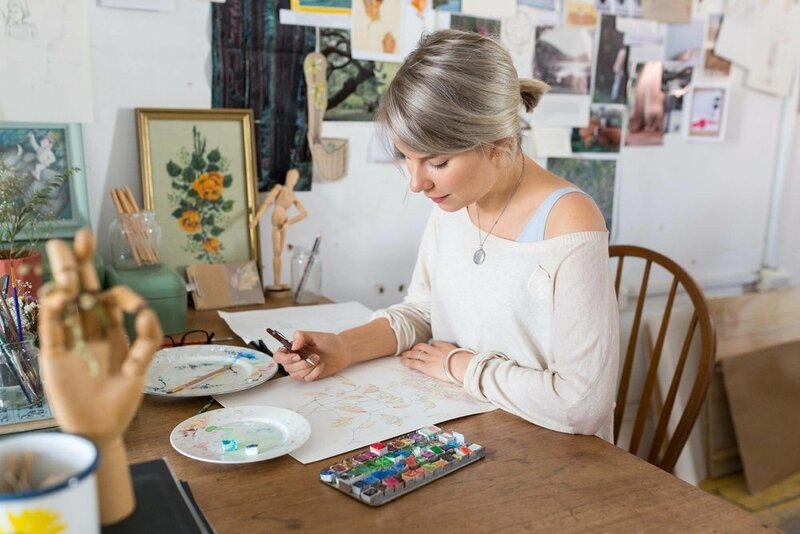 Marianna also draws inspiration from the children she teaches in her art classes at Gloworm Studios, who are some of her most honest and insightful critics and her first port of call when stuck on a particular drawing. Her work is mostly created using traditional methods including pencil, watercolour paints and fragments from her enormous collections of vintage books and travel brochures. Through her art, Marianna hopes to light a spark in the viewer's imagination so that they are temporarily transported to another time or place. Marianna completed a Bachelor of Visual Art at Monash University in 2010 and a Diploma of Illustration at Chisholm Institute in 2012. Marianna’s work has been exhibited at No Vacancy Gallery, Signed & Numbered and the Brunswick Street Gallery. Her work has been published in Home Beautiful Australia, Big Kids Magazine, Young Vagabond and the Financial Review. Marianna sells her work as prints and greeting cards to over 30 stores around Australia as well as at design markets including Finders Keepers, The Rose Street Market and Markit at Federation Square. High quality archival prints of Marianna’s artwork are available through her online store. Marianna also has a series of limited edition prints exclusive to Signed and Numbered. For all commission enquiries please contact her here. Marianna runs an art school called Gloworm Studios where she teaches painting, drawing and illustration to children and adults.